"The Federal Reserve owns no gold and therefore could not sell or lease gold to influence its price. Likewise the Federal Reserve does not engage in financial transactions related to gold, such as trading in gold options or other derivatives. Most importantly, the Federal Reserve is in complete agreement with the proposition that any such transactions on our part, aimed at manipulating the free price of gold or otherwise interfering with the free trade of gold, would be wholly inappropriate." The Federal Reserve owns ALL the US gold because it has been given as collateral against the issuance of Federal Reserve Notes that the US Government uses to fund its never ending budget deficits. This is from the Federal Reserve Annual report…. Payment for the gold certificates by the Reserve Banks is made by crediting equivalent amounts in dollars into the account established for the U.S. Treasury. These gold certificates held by the Reserve Banks are required to be backed by the gold of the U.S. Treasury. The U.S. Treasury may reacquire the gold certificates at any time and the Reserve Banks must deliver them to the U.S. Treasury. At such time, the U.S. Treasury's account is charged, and the Reserve Banks' gold certificate accounts are lowered. The value of gold for purposes of backing the gold certificates is set by law at $42-2/9 a fine troy ounce. The Board of Governors allocates the gold certificates among Reserve Banks once a year based on the average Federal Reserve notes outstanding in each Reserve Bank. The gold may (or may not) be held physically by the Treasury but its "title" has been transferred to the FED who promises to sell it back at any time for $42.22/oz. The FED and Treasury may hide behind the semantics and legalese but the FED owns the gold and the Treasury claim they own it too! Look at the assets reported below in the FED’s annual report. They claim gold certificates as assets of 11.037 B$. If you divide by $42.22/oz this is 260 Million ozs of gold, which is 8,134t which is ALL the gold that the US Treasury claims IT owns yet it is residing on the balance sheet of the FED as "gold certificates" that "are required to be backed by the gold of the US Treasury". This is why the FED can not answer questions about gold swaps because they have been dealing in gold because all the US gold belongs to them. It has to be returned at any time at a price of $42.22/oz…that would be an interesting challenge to achieve in the open market! "I have one other issue I'd like to throw on the table. I hesitate to do it, but let me tell you some of the issues that are involved here. If we are dealing with psychology, then the thermometers one uses to measure it have an effect. I was raising the question on the side with Governor Mullins of what would happen if the Treasury sold a little gold in this market. There's an interesting question here because if the gold price broke in that context, the thermometer would not be just a measuring tool. It would basically affect the underlying psychology." What Greenspan was saying way back when was that by secretly putting gold into the market, it would affect the psychology of the markets, investors and the public. This was the beginning of the gold price suppression scheme. Greenspan used the word thermometer. For a decade GATA has used the word barometer to explain why The Gold Cartel was surreptitiously suppressing the price … they SHOT THE MESSENGER! tout ça coute des sous .. les gens du Gata détestent faire la manche.. pour ça que j'insiste ..
aidez les et aidez VOUS aussi..
puisque c'est bien notre / votre cause qu'ils défendent . GATA's lawsuit against the Federal Reserve in U.S. District Court for the District of Columbia slogs on amid the Fed's desperate obstructionism. 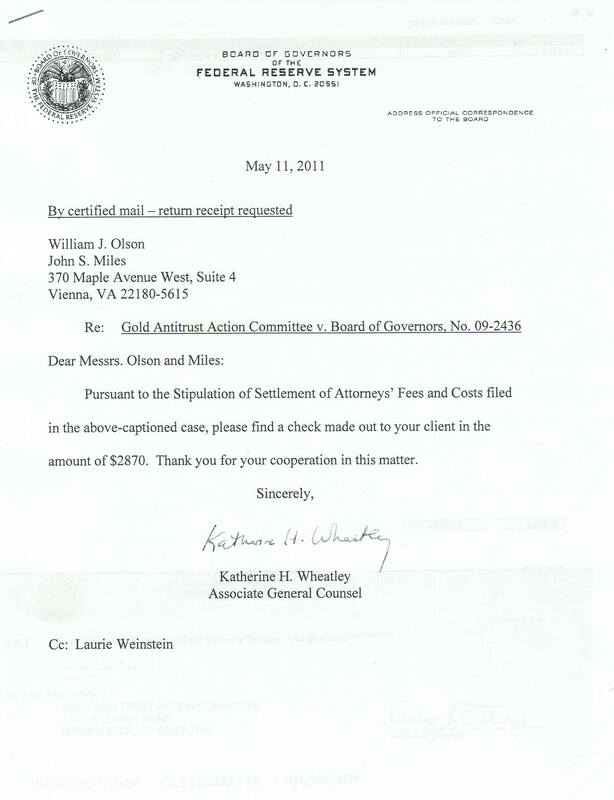 Last week, through its lawyers, William J. Olson and Jon S. Miles of the Vienna, Virginia, firm of William J. Olson P.C. (http://www.lawandfreedom.com/), GATA filed a long brief replying to the Fed's objection to a couple of GATA's requests. We have asked the court to review privately the gold-related documents the Fed doesn't want to disclose and to permit GATA to pose a limited number of questions to the Fed. Le GATA fait condamner la FED : bonne nouvelle ? GATA today scored a small but perhaps auspicious victory over the Federal Reserve in our lawsuit seeking access to the Fed's secret gold files. The judge presiding over GATA's federal freedom-of-information lawsuit in U.S. District Court for the District of Columbia, Ellen Segal Huvelle, granted GATA's motion to order the Fed to produce in complete form for the judge's private review 20 gold-related documents the Fed has sought to keep secret. The judge ordered the Fed to deliver the documents by Friday. Through its lawyers, William J. Olson P.C. of Vienna, Virginia -- www.LawAndFreedom.com -- GATA has argued that the Fed's production of gold-related documents has been so inadequate and the Fed's arguments for keeping them secret so weak that the court should review the documents acknowledged by the Fed and order the Fed to answer 25 questions from GATA about the Fed's search for relevant information. While Judge Huvelle still could grant at any time the Fed's motion to dismiss GATA's lawsuit, her ruling today at least implies a little skepticism about the Fed and its tactics. Combined with today's statement by U.S. Rep. Ron Paul, the new chairman of the House Financial Services Committee's Subcommittee on Monetary Policy (http://www.gata.org/node/9495), Judge Huvelle's ruling gives hope that the Fed's enormous secret power to rig markets and bestow the most fantastic patronage on a parasitic financial elite can be brought to account eventually. If the U.S. gold reserves are just sitting somewhere, inert, unencumbered, and unused for surreptitious market intervention, what's the problem with full disclosure? Financial journalists unafraid of aggravating the world's financial powers should start putting gold-related questions to the Fed and other central banks and stop simply assuming that secrecy should be the normal order of things with central banks and gold. This struggle could have been undertaken easily and likely more effectively by the World Gold Council, which aims to represent gold mining companies and gold investors. But the council's indifference to questions of surreptitious central bank intervention in the gold market has left the struggle to GATA. We need your help to pursue this struggle to victory for free markets, limited government, and a better, fairer world. Du moins à court terme. A quand une mesure de rétorsion de la Fed qui déversera des montagnes de PQ pour faire baisser les cours ? je précise, pour ceux qui comprennent pas l'anglais .. que le juge a ordonné à la FED de produire les pièces demandées par le gata.. ce que jusqu' à présent était refusé.. au prétexte du secret nécessaire ..
ça progresse encore, et Gata va notamment mettre la main sur quelques documents déclassifiés du secret, par la juge Ellen Segal Huvelle..
et en tout état de cause.. Gata aura confirmé ses travaux sur le rôle de la Fed dans la manipulation du marché de l'or, en conduisant des opérations secrétes.., et notamment des swaps -échanges d'or..
sans compter qu'on espére bien que Ron Paul, nouveau patron de la House Financial Services Committee's , sous commission de la politique monétaire domestique.. reprendra le BB ! j'attire votre attention sur un des documents que Gata a réussi à obtenir de la FED.. The minutes show committee members acknowledging the heavy involvement of central banks in gold leasing, with the British delegate estimating that a year's worth of gold production already had been sold forward. c'est d'autant plus savoureux cette réflexion de la délégation anglaise .. quand on sait ce qui s'est passé à peine 2 ans plus tard ..
vente de la quasi totalité des réserves d'or de la BOE au plus bas du cours de l'or .. 250 $ l'once ..
Western government and central bank officials discussed coordinating their gold market policies at a private meeting of the G-10 Gold and Foreign Exchange Committee in April 1997, according to minutes of the meeting released to GATA today by the Federal Reserve Board upon the order of a federal court. The minutes also quote a U.S. delegate as warning that a rising gold price would increase the U.S. government's debt burden. 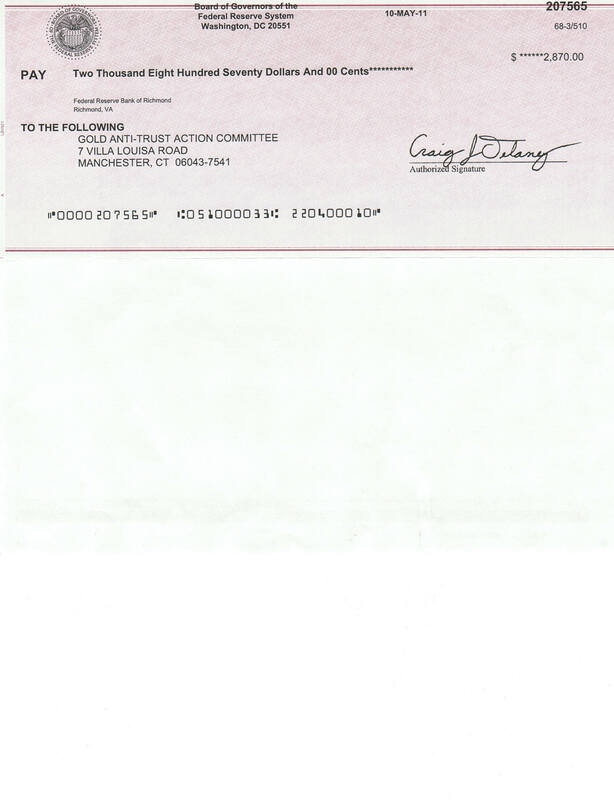 The document was only one of many whose release was sought by GATA in its freedom-of-information lawsuit against the Fed in U.S. District Court for the District of Columbia. The judge, Ellen Segal Huvelle, ruled two weeks ago that other documents containing the Fed's gold-related secrets were exempt from disclosure under the law. The G-10 committee minutes were compiled by New York Fed official Dino Kos and were transmitted to the Fed's Board of Governors by Edwin M. Truman, then director of the Fed's International Finance Division and a participant in the meeting. They quote a British delegate as saying that while the gold price seemed "sluggish," the gold market itself was actually showing "resilience" and "physical demand is high." The British delegate described the gold market as "traditionally secretive." The minutes show committee members acknowledging the heavy involvement of central banks in gold leasing, with the British delegate estimating that a year's worth of gold production already had been sold forward. That was 14 years ago and of course much central bank gold leasing followed until the last year or so. According to the minutes, the U.S. delegate cited above, identified only as "Fisher" -- apparently Peter R. Fisher, head of open market operations and foreign exchange trading for the Federal Reserve Bank of New York -- also warned that central bank gold sales and leasing might be construed as positive for gold. The minutes say: "First, he noted that some market cynics viewed central bank activity as a contrary indicator and therefore one had to be conscious of possible feedback effects. Second, he noted that the price of gold, unlike other commodities, had historically not trended toward the cost of production. This seemed to suggest an ongoing supply/demand imbalance. Third, he had the sense that the gold leasing market was an important component in this puzzle, though he did not understand enough about that market, particularly the credit risk aspects of gold lending." A Canadian delegate, the minutes say, wondered whether data about the gold market could be trusted -- a point much pressed by GATA and others lately. U.S. delegate Fisher, the minutes say, "explained that U.S. gold belongs to the Treasury. However, the Treasury had issued gold certificates to the Reserve Banks, and so gold (by these means) also appears on the Federal Reserve balance sheet. If there were to be a revaluation of gold, the certificates would also be revalued upwards; however [to prevent the Fed's balance sheet from expanding] this would lead to sales of government securities. So the net benefit to Treasury would need to be carefully calculated, since sales of government securities would expand the public portfolio of government securities and hence also expand the Treasury's debt-servicing burden." This seems to be as candid an acknowledgement as any of the U.S. government's profound interest in suppressing the price of gold. "I'd sort of like to see how much gold is actually there and whether we've made any agreements to loan out our gold or sell the gold, because there's a lot of questions about that. As a matter of fact, I'm going to have hearings on having a true audit of the gold, and they're very, very resistant to that. But if the gold is all there and there are no attachments to the gold, what's the big deal? Why shouldn't the people know that it's there?" Paul added in the CNBC interview that his broader objectives include getting the Fed out of central economic planning, getting the United States out of its fantastically expensive foreign military adventures, and allowing people to keep more of the fruit of their labor. GATA will be providing information to Paul's office for possible use in interrogation of the Fed. ce que n'aurait jamais fait un auditeur indépendant ! l'or détenu à NY n'est pas du tout celui du trésor US, mais et pour la plus grande partie, l'or stocké pour le compte d'autres nations ! l'aricle reprend donc point par point les éléments fournis par latimes et en effet on ne peut qu'hésiter entre incompétence journalistique grave et désinformation ! la Monnaie a donc remboursé son paiement. faire toute une obstruction, demander un chéque de plus de 3000$, pour ne finalement délivrer que 134 pages, c'est se moquer du monde! En outre et sur les documents analysés par Koos, il a pu relevé de nombreuses erreurs dans l'évaluation des quantités ou poids des barres : à croire que les audits sont faits par des amateurs !